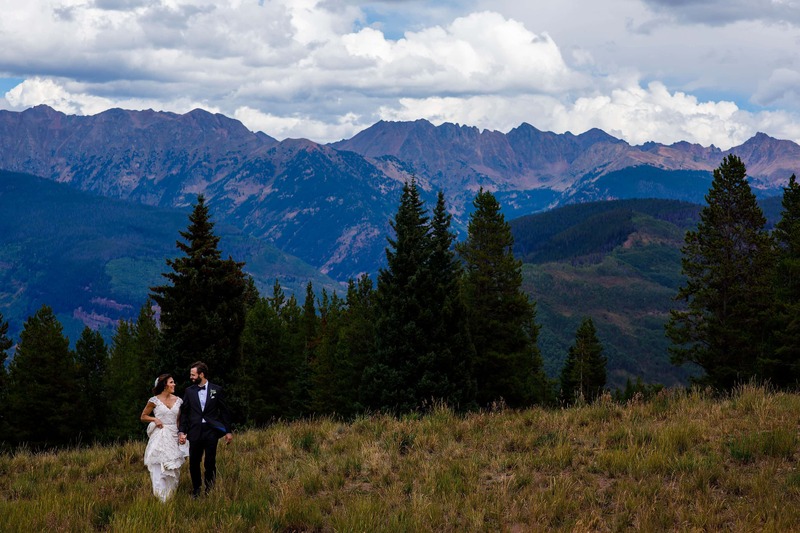 Vail Colf Club is located in the heart of the Vail valley and includes an outdoor ceremony island and new reception space, both with views of the Gore Range. You can book either or both the Vail Wedding Island or Gore Range Banquet Room for your special day. Each space can accommodate up to 160 seated guests. The ceremony island is located a quick shuttle ride away from the clubhouse. You’ll enjoy the walk across the bridge as all your friends and family look on. In the fall, the aspen trees beyond the ceremony only further the beauty of this location. The Gore Range room and adjacent covered patio are brand new. Bernie McManus and his staff are there to help you plan a memorable event. If you’re looking for a wedding venue in Vail stop by and check it out. This feels nothing like a golf course thanks to the peaceful ceremony island that's a hidden treasure. A large aspen grove near the ceremony site is a great place for a few quick portraits before cocktail hour. If you can, budget time to take the Eagle Bahn gondola from Lionshead to the top of the mountain for your first look with 360 degree views.